← Review – “Rafa”: Humility and Family Above All. 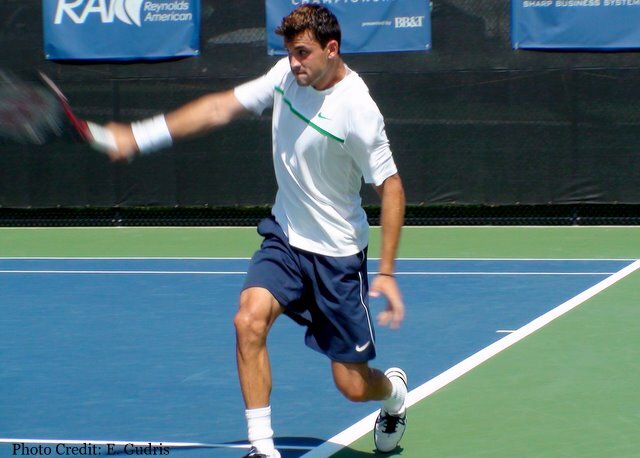 Dimitrov and Roddick Get Through Shaky Day at Winston-Salem Open. I’m not sure many pros have had to deal with an earthquake while competing on the court. But that’s what happened today as 5.8 quake hit near Washington D.C. this morning, sending shockwaves up and down the east coast and causing a temporary halt to play up at the WTA event in New Haven. Although some in North Carolina felt the shaker, including those inside the Winston-Salem Open media center building, fans out on the grounds and the players on-court didn’t seem to notice anything amiss and play continued as normal. One player who did feel the quake but inside his hotel room was No. 6 seed Kevin Anderson who later withdrew from the tournament after telling Tournament Director Bill Oakes that he wasn’t feeling well and wanted to rest up for the U.S. Open. This looked like an opportunity for his opponent Ryan Harrison who was scheduled to play Anderson in the afternoon. But instead Harrison faced “lucky loser” Pierre-Ludovic Duclos from Canada. Harrison, himself getting over the after effects of food poisoning from a few days prior, looked tired most of the match except for one moment after he dropped serve when the young American hurled his racquet out of the court earning himself a warning. Duclos, who played steady throughout, made the most of his opportunity and earned a 7-5, 7-5 win and will now face Robin Haase who dispatched veteran James Blake earlier 6-4, 6-1. The match of the day ending up being a topsy-turvy one between Grigor Dimitrov against Donald Young that saw Young, after dropping the first set, earn a warning after he smashed a water bottle in front of the umpire’s chair then proceeded to berate the umpire about being given the warning. Young used the incident to fuel his game, taking the second set 6-2. Dimitrov, who struggled to keep the ball in the court most of the match, found his game just in time during the third set to overcome and early break of serve and then earn a break of his own to serve for the match at 5-4. But Dimitrov faltered and dropped served but then managed to serve himself into a tiebreak that he dominated to finally win 6-4, 2-6, 7-6 (2). Dimitrov now faces Alex Dolgopolov Jr. in the third round. The night session featured the debut of Andy Roddick at the event as he took on France’s Edouard Roger-Vasselin. Roddick, surrounded by a packed stadium of 3,800 fans looked very comfortable on court as Roger Vasselin did little to trouble Roddick as he cruised to a 6-2, 6-4 win that had Roddick looking very relieved to have his first win since Wimbledon in June. Roddick said later he was focused on his form this week in Winston-Salem and not for New York although if anyone needs some stability after a shaky few months, it’s the former U.S. Open champion. Tomorrow Roddick will face the winner of the Blaz Kavcic vs. Santiago Giraldo match later tonight. Comments Off on Dimitrov and Roddick Get Through Shaky Day at Winston-Salem Open.